At US Medical Supplies, we know you have many choices of vendors besides us when it comes to shopping for mobility aids and medical necessities. That's why we strive to be number one in every area of the sales process - from product quality and customer service to shipping and pricing. Getting the items you need most to live a rich and fulfilling life shouldn't be difficult, and it shouldn't have to cost you a fortune. Our goal is to offer our customers the best products at the best prices, every time they shop with us. 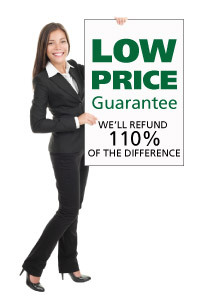 If you can find another vendor advertising an identical item at a lower cost than we offered, we'll match that price. If you have already ordered from us and find a better advertised deal on an identical item within 10 days of your purchase, we'll refund 110% of the difference to you. That's it. No gimmicks, no strings attached. All we ask is that you provide us with a copy of the advertisement that offers a lower price than we do - and in many cases, you may not even have to do that, because we can often give you a lower price over the phone than we can advertise on our website! 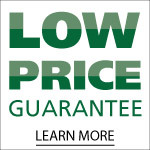 Some exceptions may apply to the Low Price Guarantee, so check for a Low Price Guarantee badge when browsing products - if you see the image to the right of this paragraph on that product's description, you're covered!